China has become an increasingly important trading partner for U.S. agriculture, which makes the escalation of the conflict over tariffs and retaliation particularly troubling for American farmers (farmdoc daily, June 8, 2018). In Illinois, corn prices have fluctuated over the last five months from a high of $3.78 down to a low of $3.09. In the same period, soybean prices have declined $2.50 from a high of $10.34 to a low of $7.84 in the middle of July. Since then, prices have rebounded slightly, but are still well below prices during spring. In this article, a timeline of events associated with trade disputes are superimposed on price changes. 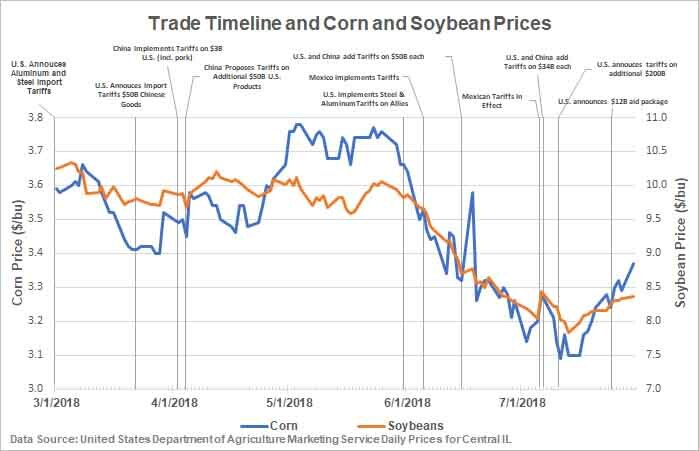 In the figure below, Central Illinois corn and soybean prices are shown in conjunction with a timeline of significant events in the escalating trade negotiations by the Trump Administration. During his presidential campaign, President Trump placed a priority on renegotiating trade agreements with U.S. trading partners. Since the election, the Trump administration has taken steps to change trade agreements. A significant event with implications for agriculture was the March 1st announcement that the U.S. would impose a 25% tariff on imported steel and 10% tariff on imported aluminum (farmdoc daily April 18, 2018). This tariff announcement launched a series of responses from U.S. trading partners that are on-going. In the three weeks following the March 1st announcement, corn and soybeans both trended downward, corn beginning at $3.59 falling to $3.41 and soybeans began at $10.27 and declined to $9.80. On March 22nd, the U.S. announced new tariffs on approximately $50 billion worth of Chinese goods in an effort to rebalance our trade relationship and address intellectual property. The following day China outlined their plans to impose tariffs on $3 to $5 billion of U.S. products including pork, recycled aluminum, steel pipe, fruit, wine, and tree nuts. On April 2nd, China implemented the tariffs associated with the March 23rd proposal, hitting $3 billion worth of U.S. imports with tariffs. The following day the U.S. released list of approximately 1,300 targeted products for tariffs totaling $50 billion worth of Chinese goods, continuing to act in response to alleged intellectual property theft. On April 4th, China published a list of 106 products which they say will receive a 25% import tariff–mainly automotive products and agriculture commodities including soybeans, corn, ethanol, sorghum, and beef, among others. Throughout April and May, trade negotiations with China continued, and the U.S. also progressed on renegotiating the North American Free Trade Agreement (NAFTA) and continued in trade talks with other partners. During this period corn and soybeans prices experienced some volatility but both commodities ultimately ended at prices near March 1 levels. On May 24th the U.S. announces tariffs on imported cars, trucks, and auto parts. Although directly correlated with the automotive industry, the significance of this move in regards to agriculture is that 98% of American car imports came from major allies, like Canada, Mexico, the European Union, Japan and South Korea, opening the door for potential retaliation that could target U.S. agriculture. On May 31st the U.S. announces plans to impose a 25% tariff on steel and a 10% tariff on aluminum imported from several of its closest allies, including the European Union, Canada, and Mexico. The countries were previously exempted from the U.S. tariffs on imported metals. Throughout the last week of May through early June, ally countries threaten retaliation against the U.S. On June 5th Mexico follows through, announcing retaliatory tariffs on $3 billion worth of U.S. goods, to be enacted in two phases with the second phase scheduled one month later on July 5th. Among targeted products is pork, subject to a 20% tariff. From May 24th through June 14th corn dropped $0.41 and soybeans lost $1.08, each falling 11% in the three-week period. Market reaction for the two commodities seems especially noticeable in this period when the U.S. began including allies in the trade war. On June 15th the U.S. enacted a 25% tariff on an additional $50 billion of Chinese goods, with the first $34 billion scheduled to take effect on July 6 and the remaining $16 billion subject to review. In the same day, China announced it would retaliate with addition tariffs of equivalent size. Mexico began imposing its second stage of retaliatory tariffs on July 5th, including the collection of an additional 25% tariff on imported U.S. pork. When combined with previous import taxes, U.S. pork is subject to a more than 70% tax rate in China. The U.S. tariffs of 25% on $34 billion in Chinese goods, the first portion of the $50 billion included in the June 15th announcement, went into effect on July 6th. China reacted quickly, introducing an equivalent 25% tariff on $34 billion in U.S. products. This set of moves is regarded as the official start of a full-fledged trade war. Prior to this, the key trade events were mostly threats to introduce tariffs, implementation of tariffs to take effect at a later date, or imposition of tariffs on a few very specific products. In this move, tariffs applied to more than 800 Chinese products. China’s retaliation imposes tariffs on a list of more than 500 U.S. products, including soybeans and pork among other agricultural products. June 15th can be seen as one crucial turning point, when the U.S. released a specific list of targeted products and announced an effective date three weeks out and China responded with tariffs on an equivalent value of U.S. products. In the one month following June 15th, corn prices fell nearly 7% while soybean prices dropped more than 10%. The next crucial turning point is July 6th, when the reciprocal tariffs went into effect. In the one-week period following the announcement $0.18 was shaved off the corn prices, while soybeans lost $0.59. On July 10th, the U.S. escalated the trade dispute with China by announcing plans to impose tariffs on $200 billion worth of additional Chinese goods. President Trump also declared the U.S may ultimately impose tariffs on up to $500 billion worth of Chinese products, approximately the total amount of U.S. imports from China last year. A public hearing on tariffs will take place in the second half of August. Although still well below higher spring prices, the corn and soybean markets have improved from the mid-July low points. Over the last five months, there have been tariff proposals by the U.S. and its trading partners. In the same period, Central Illinois corn and soybean prices have both dropped substantially. How much of the price decline is due to trade negotiations is an open question, but it did play a large role in those price declines. With these price declines, incomes prospects for 2018 have dimmed. Now, incomes near 2016-2017 averages appear possible under specific conditions (farmdoc daily, July 10, 2018). Perhaps just as important are immediate price declines are the long run nature of economic responses to trade disruptions. Lessons from the 1980 USSR trade embargo suggest trade flows could be impacted over many years (farmdoc daily, July 13, 2018). Burak, S., K. Baylis and J. Coppess. "Gambling on Exports: A Review of the Facts on U.S. Agricultural Trade." farmdoc daily (8):105, Department of Agricultural and Consumer Economics, University of Illinois at Urbana-Champaign, June 8, 2018. Burak, S., K. Baylis, J. Coppess and Q. Xie. "A Looming Trade War – An Illinois Ag Perspective." farmdoc daily (8):69, Department of Agricultural and Consumer Economics, University of Illinois at Urbana-Champaign, April 18, 2018.